No other graphic application generates excitement or interest like a full building wrap or an oversized mural. Create enthusiasm for exhibits, events, marketing messages, or downtown revitalization projects with a quality building wrap or mural. Graphics can be applied to the faces of many buildings or stretched on a mounted frame. 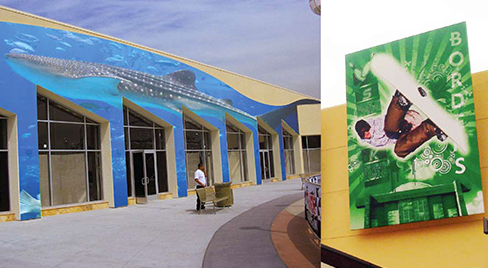 Building wraps are printed on specialty graphic film or vinyl mesh with UV durable inks. Wall Murals are a striking addition to any space. Large scale graphics get your message across and create a unique environment for your guests to enjoy. Murals can be any shape or size to accommodate any wall shape or design. Because they are so easy to apply and remove, wall murals can be changed as often as you like to coordinate with any marketing campaign. These professional wall murals are printed on gloss or matte substrate with permanent or removable adhesive.